This is not an average snow year, at least so far. Even without perusing into the NRCS-Snotel reports for Mores Creek Summit we are behind snow amounts this winter. 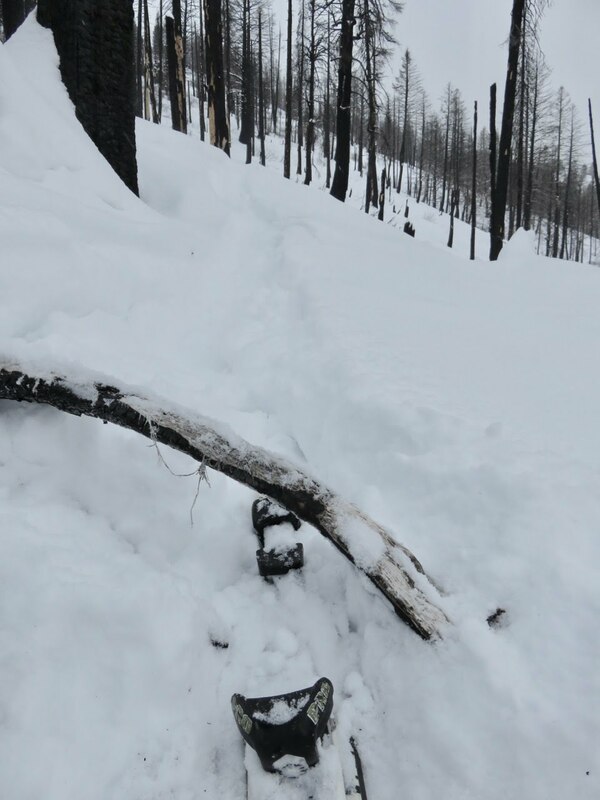 Throughout the years I developed a rule-of-thumb to start backcountry skiing at MCS when there was more than a meter of snow at the MCS Snotel. 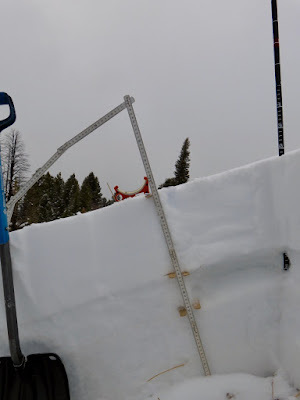 I broke the rule yesterday, with a reported snow depth of 66 cm at MCS snotel. Skiing was fun above 7000 feet, with a somewhat unconsolidated snowpack at spots. Turns were sweet with fast pow skiing conditions. Below 7000 feet you had to pay attention to what might be lurking below the snow surface. 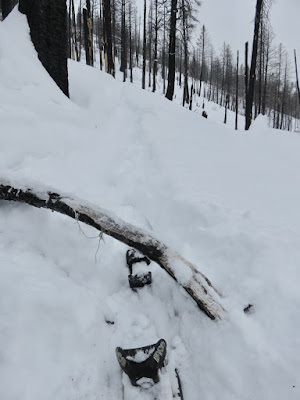 I was very careful and still one of my skis managed to get snag when it got caught in deadfall but it fortunately easily released. 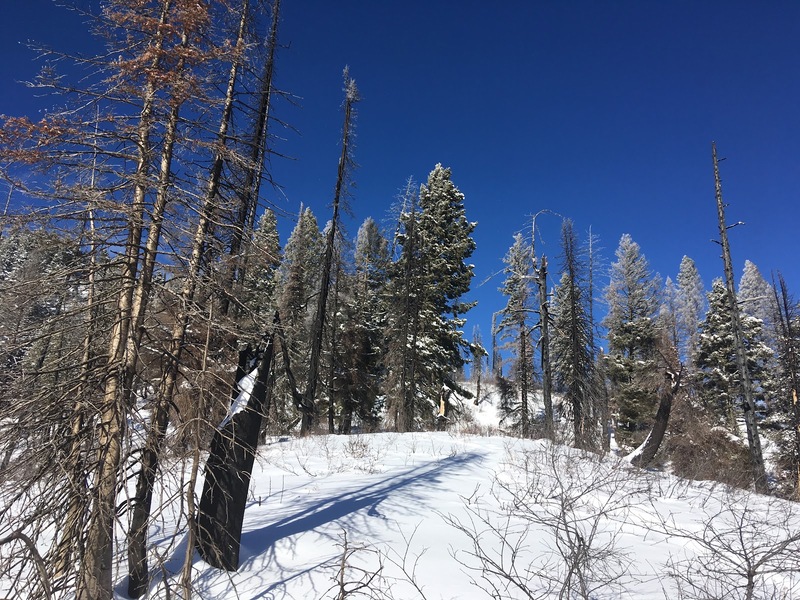 Be careful, the snow cover is shallow below 7000 feet, and last year's Pioneer fire left a lot of fallen burnt trees. 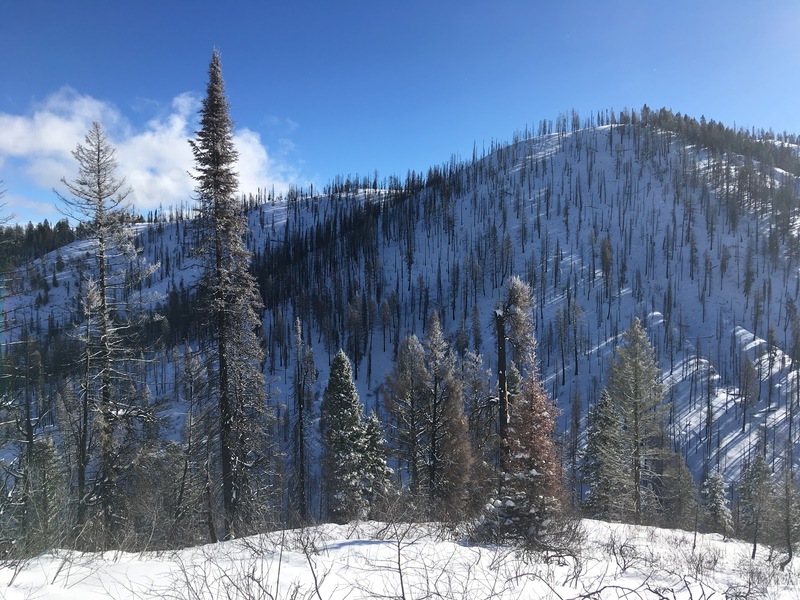 What about the snowpack? The snowpack was definately unstable. This was not a surprise considering the extended dry conditions during December that allowed near surface facets to develop. It was easy to find evidence of instability. There were multiple crown fractures from avalanches released during the last storm, and plenty of surface cracking with whumpfs. Quick "hand-compression" either failed during isolation or easy collapses when tapping the column. 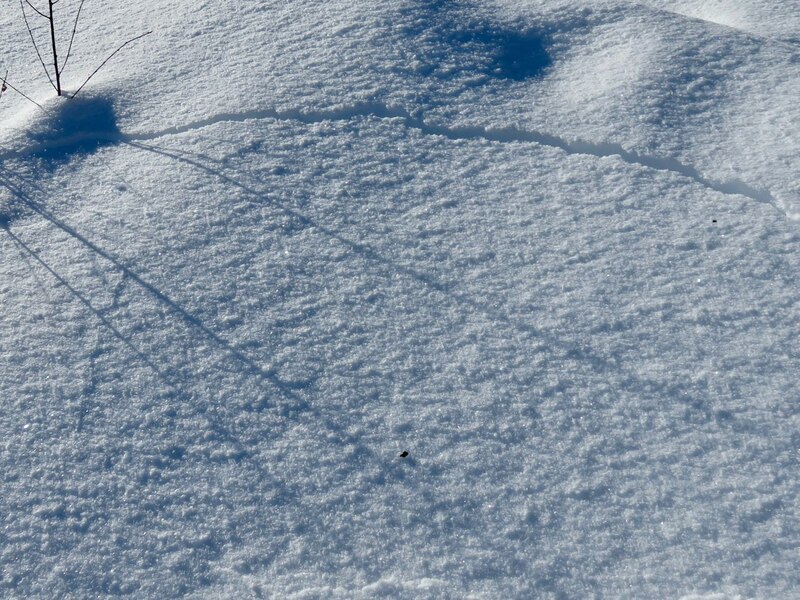 The depth of the instability varied from 20 to 30 cm from the snow surface to the interface between the new snow and a well-developed facet layer. At the interface, between the new snow and facets, there was a fragile crust layer - which is definitely not good! 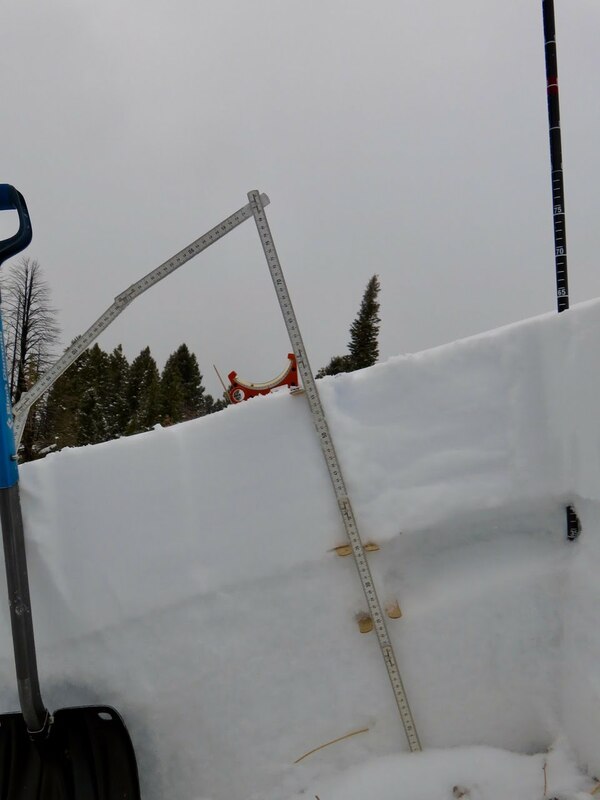 At ~7200 feet in elevation a snowpit with NE aspect and 28° slope angle was 63 cm deep (HS). The new snow layer was fist hard with a layer thickness of 21 cms. 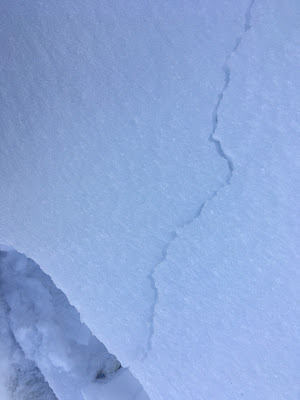 There was a thin crust layer between the new snow and facet layer insterface. The facet layer under the crust was 9-10 cm thick. Below the facet layer there was a 25 cm thick pencil hard layer of rounds. Fracture failures were ocurring at the top of the facet layer, right at the crust to facet interface. I recommend using saving SnowPilot website and database to generate and save your snowpit profiles. SnowPilot web based application is free and it is based on AAA SWAG standards. 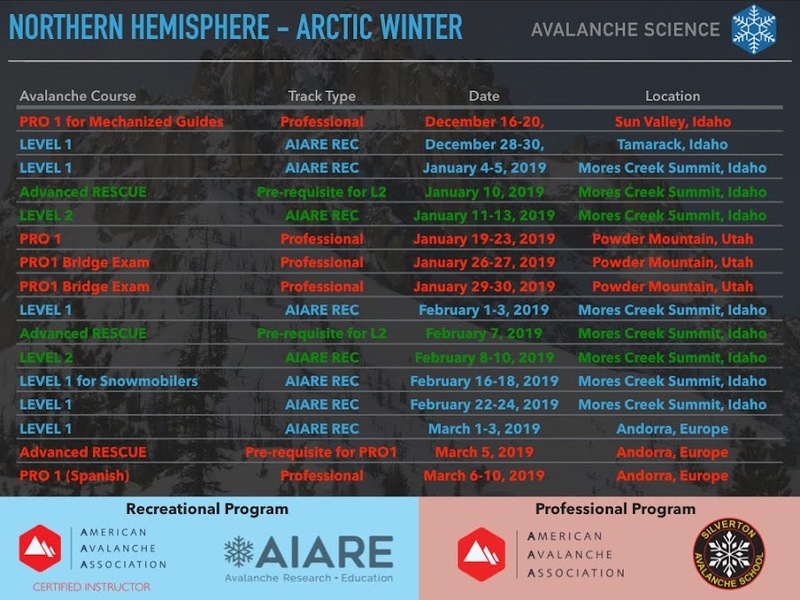 Sharing your snowpit and avalanche observations you will advance Snow Science since the data is used for research, while at the same time you are refining your snow, avalanche, and weather standarized nomenclature. 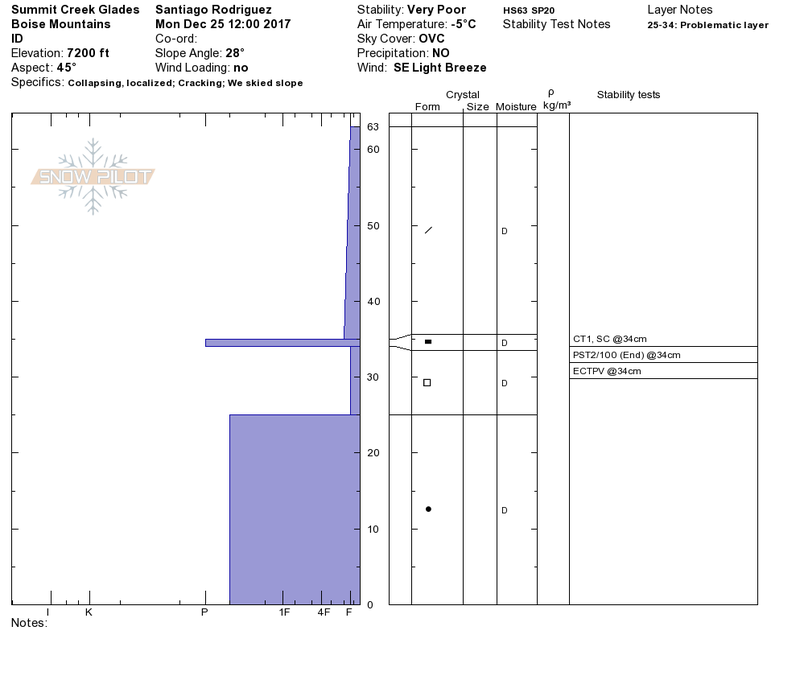 The snowpack at MCS has a persistent slab structure. This instability will be with us for a while. The faceted layer is well developed with a thickness of up to 10 cm. As the new snow sinters and further develops into rounds, the reactivity of this avalanche problem will decrease. Be mindful of the existing snowpack weak structure at MCS, this a rare event, and it has been more than 30 years since MCS had experienced such a low SWE water year. Since this is a rare event, we do not have experience with this conditions at MCS. 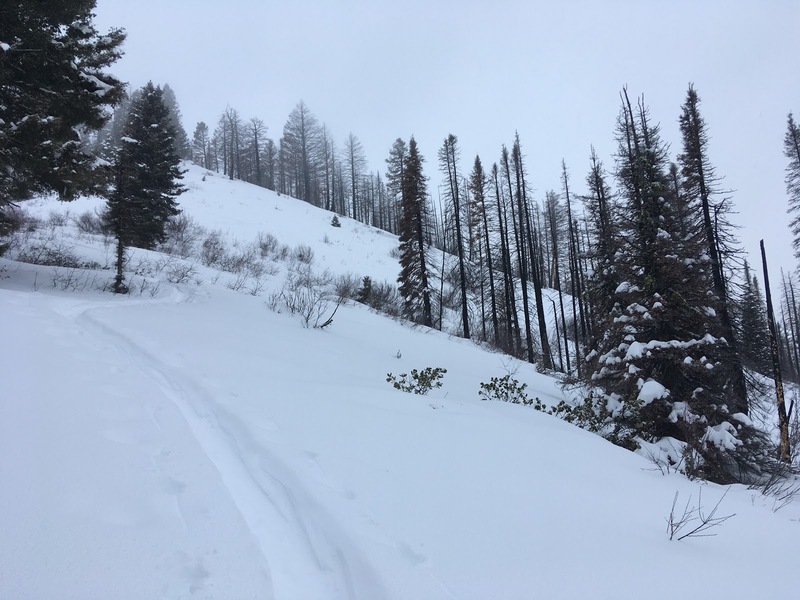 At the same time, persistent slab conditions tend to be unpredictable and easily propagate across distances, significantly raising the consequences when caught in an avalanche at slopes with terrain traps. And the bad news is that MCS has many terrain traps, plenty of steep creek bottoms and fun treed terrain that will become a nightmare if caught in a slide. The coverage is still poor as you will see in the pictures included below. Let's keep the fingers crossed for the next storm arriving tonite. The forecast is not too encouraging with respect to precipitation amounts, but surprises do happen. For those interested in downloading into their phones topo maps with "colored" slope angles, you will find in Avenza a collection of FREE maps I made available for MCS where you can overlay your track while touring. It is a nice tool to get an idea of slope angles while touring or skiing. Below a sample of the Avenza application screen. Avenza is a FREE smartphone application where I am providing FREE georefenced maps for popular backcountry skiing destinations in Idaho. You will find at AVENZA MAP Store, topo maps with colored slopes angles for Pilot, Freeman, Wilson, and Sunset Peaks. There is also a "colored" slope topo map for Copper Mountain at Banner Summit. Finally, I wil be uploading into GAIA tracks from tours at MCS. These two GPS tracking apps (GAIA and Avenza) are good tools that further improve terrain situational awareness.